Putting LSL's strategy into action. The execution of the strategy results in market leading positions in the Group’s business segments which produces a virtuous circle of strong revenues, profitability and cash flow which allows significant reinvestment in the business in order to further enhance LSL’s market positions while also paying out a significant proportion of earnings as a dividend to Shareholders. 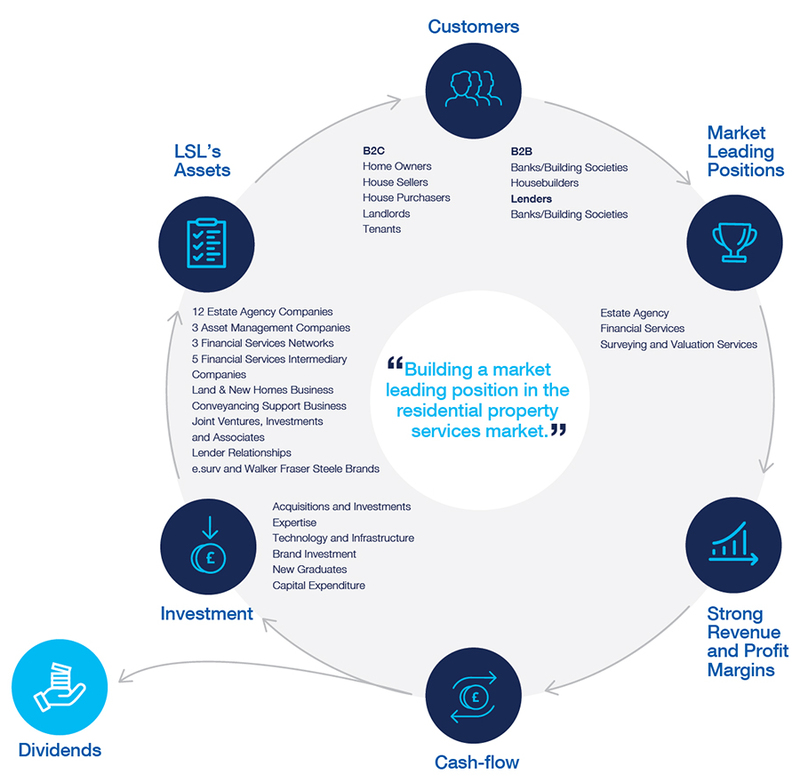 LSL is the market leader in Surveying and Valuation Services, second largest combined network in Financial Services, and has market leading positions in Estate Agency. LSL serves retail customers in its Estate Agency businesses, such as house sellers and buyers, and landlords and tenants by providing Residential Sales, Lettings, as well as mortgage and non-investment brokerage services and other related services. LSL serves business customers in its Surveying and Asset Management businesses, such as banks and building societies, and benefits from long-term relationships and contracts. The growth and reputation of LSL is dependent on providing exceptional service and appropriate outcomes for customers. The business model has demonstrated resilience to changes in the residential property market due to its market positions in Lettings (recurring income) and Asset Management (countercyclical income). The business has low capital requirements and is highly cash generative. The recent creation of keystone branches in Your Move and Reeds Rains creates a platform that will benefit from their larger scale, enabling us to invest in people and technology with the aim of providing enhanced levels of service to our customers whilst ensuring operational performance is optimised by competing more effectively in local markets and utilising central hubs to handle certain administrative tasks centrally. The Financial Services business is a leading financial services distributor and includes highly regarded back-office and administration technology (Toolbox) which has been designed to build scale and opportunity for its financial services intermediaries. The model benefits from scale and investment to ensure the Surveying and Valuation Services business has the best technology in the market to help it maintain its market leading position and to improve quality, service performance and risk management for clients. LSL allocates the strong cash generation between paying dividends to Shareholders, reinvesting in the business to drive future organic growth, and in making selective, value adding acquisitions.